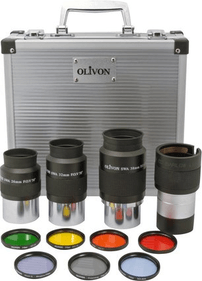 Below you will find a complete overview of all available filters and their various functions. Filters make sure contrasts are observed with more clarity. What is more, a great number of observations can only be done in this way! When you are going to observe Mars, for example, you can use a yellow filter in order to get a good view of the clouds. For the polar caps you use a green filter, and so on. Please find the manual below. For increasing contrast between lunar features of varying brightness. Enriches blue heavens with a deeper shade of blue. Moon: for increasing contrasts between lunar characteristics under various light conditions. Venus: to be able to view the contrast of the thick Venus cloud under good light conditions. Mars: for increasing contrast of the polar caps, frozen areas and low-hanging clouds. Jupiter: for darkening atmospheric currents. Mercury: to reduce the brightness of the observation during daytime observations. Venus: to reduce the brightness of the observation during daytime observations. Jupiter: to be better able to observe the belt structure. Saturn: to have a better look at the atmospheric bands. Moon: (somewhat useful) for increasing contrast of lunar features. Mercury: to improve observations when Mercury is in the twilight zone (when the planet is close to the horizon). Venus: to reduce brightness when observing during the daytime. Mars: to improve contrast of the polar caps, frost areas and ochre deserts. Jupiter: (very useful) to be able to observe blue-tinted cloud formations. Saturn: to be able to establish the blue-tinted cloud formations. Moon: to increase contrast between lunar features in various light conditions. Venus: to view the cloud patterns. Mars: to increase contrast of the polar caps and to be able to observe frost. Jupiter: to enhance visibility of the big red spot. Saturn: to be better able to observe the white elements in the atmosphere. Moon: to increase contrast between lunar surfaces. Jupiter: enhances the boundaries between the red belts and the adjacent bright zones. Mars: useful during violet clearing and when studying surface characteristics of polar caps. Saturn: improves low contrast details of cloud formations. Moon: to improve contrast and to reduce irradiation between lunar characteristics (suitable for telescopes under 127mm). Venus: (slightly useful) for revealing low-contrast banding in Venus’s thick clouds. Mars: to darken blue and green maria, oases and channel demarcation. In addition, orange desert areas are highlighted. Jupiter: (somewhat useful) for darkening currents in blue tints and improving details in small orange-red features in the belts. Neptune and Uranus: (somewhat useful) for improving very subtle dark features (suitable for telescopes of 250mm and bigger). Comets: to bring out highlights in yellowish comet dust tails and to improve the contrast of comets. Mars: to increase the contrast of polar icecaps, frost areas, low-hanging clouds and dust storms in the deserts. This filter also highlights boundaries of yellow dust storms. Saturn and Jupiter: contrasts blue and red features. Neptune and Uranus: (slightly useful) for improving very subtle dusky features (for scopes of 250mm and bigger). Comets: to bring highlights in yellowish comet dust tails to the fore and to improve the contrast of comet heads. Mercury: (somewhat useful) for improving observations of rarely visible vague surface features (suitable for scopes of 200mm and bigger). Venus: to improve contrast of faint dark shadows of the upper cloud sheet. Mars: to detect high clouds and mist above the polar icecaps (suitable for telescopes of 200mm and bigger). Jupiter: to enhance boundaries between the reddish belts and the adjacent bright zones in the upper atmosphere. Comets: for observing brighter comets (suitable for telescopes of 200mm and bigger). This filter enhances the contrast of the lunar surface and blocks out superfluous light.